It wasn’t until I began to take wine seriously that I became interested in the story behind a bottle of wine. My first interest was the variety and then, with a bit of experience, I began to consider style. The story of the winery came much later, after I began to grapple with wine regions. I think it was simply because there is so much to learn about wine. Now as I scan a wine label looking for the variety or region I can’t help but wonder about the story behind the wine – the land, the climate, the individual challenges of making wine in that location. When what I eventually taste in the glass is compelling, I can’t help but wonder about the people who made it. I recently had an experience that perfectly followed this arc of discovery and then went one step beyond. It began with an offer of sample wines for review. The producer, Domaine Bousquet, was new to me. That’s always a plus; I love making new discoveries. As I read about the location of the winery and the viticultural practices I knew I wanted to taste the wines. Kate Corcoran of Creative Palate Communications made that happen and before long we were tasting samples of Domaine Bousquet’s Gaia wines. When Kate extended an invitation to join she and Anne Bousquet for lunch Kate had no idea how much I had enjoyed the Domaine Bousquet wines (our Cellar Note had yet to publish). I welcomed the opportunity to put a face to those outstanding wines. What I knew about Anne before meeting her I learned from Kate. She is the daughter of a winemaker with ambitions that drew her out of the family vineyard in the south of France to the University of Toulouse where she earned a BA in Economics. A Master’s Degree in Applied Economics followed at St. Cloud State University in Minnesota where she met her future husband Labid Al Ameri (Labid holds an MBA and is a former international equities trader). The couple moved to Boston and busied themselves with careers in Economics and Financial Trading. Their life together since the 1990s has been busy, taking them from Boston to Brussels for work, and then to Tupungato, Argentina (for work of a different kind) and finally to Miami to live (much of the time). They now have a young daughter and a winery in Tupungato to run. A busy life. The restaurant was crowded and filled with the sound of diners enjoying their meals. Without batting an eye, Anne made her way to our table balancing a partial case of wine along with her handbag – all while reaching out to shake my hand. Long before we finished our meal and wine tasting I decided this first impression must be a reflection of Anne’s life – successfully balancing education, international work, career changes for herself and her husband, family and the travel that came along with all of it. And all with a smile I bet. We went on to enjoy a meal and wines all the while filling in the story of Domaine Bousquet. Anne’s father Jean Bousquet visited Tupungato in the Uco Valley, an hour south of Mendoza city in Argentina, in the early 1990s. Before the end of the decade, he sold his vineyard and winery in southern France and purchased a parcel of undeveloped land in Tupungato. 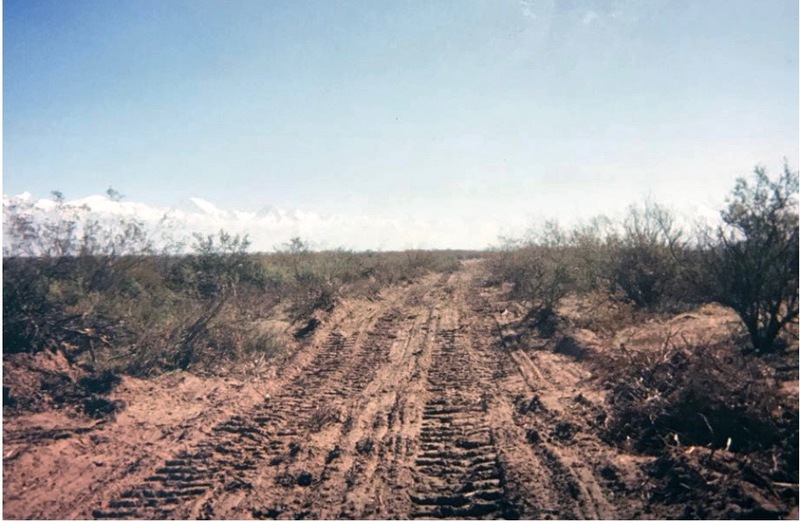 He was attracted by the elevation (4000 feet above sea level), the soil (low-vigor, sandy soils), the constant wind and dry conditions. 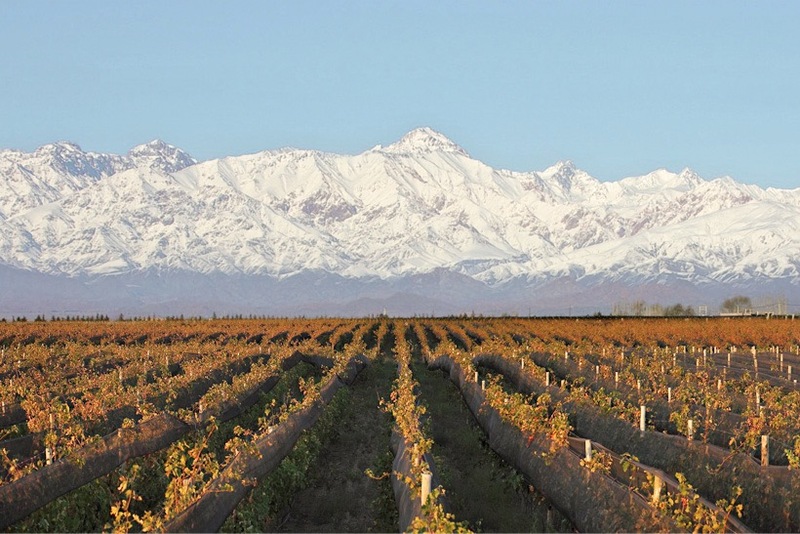 The rain shadow of the Andes Mountains means the rainfall in Tupungato is slight, a mere 7 inches per year (Napa Valley receives an average of 20 inches) but groundwater is adequate allowing for irrigation. The high elevation means days are not too hot and evenings are very cool – the perfect combination to produce grapes that are fully ripe (but not too ripe) with excellent acidity. Anne recounted that the family joked that her father had bought a beach, not a vineyard. But Jean was undeterred and went on to develop the vineyards, some of which were planted to French clones (Pinot Noir, Chardonnay, Syrah). From the very beginning Jean was committed to farming this virgin land organically. 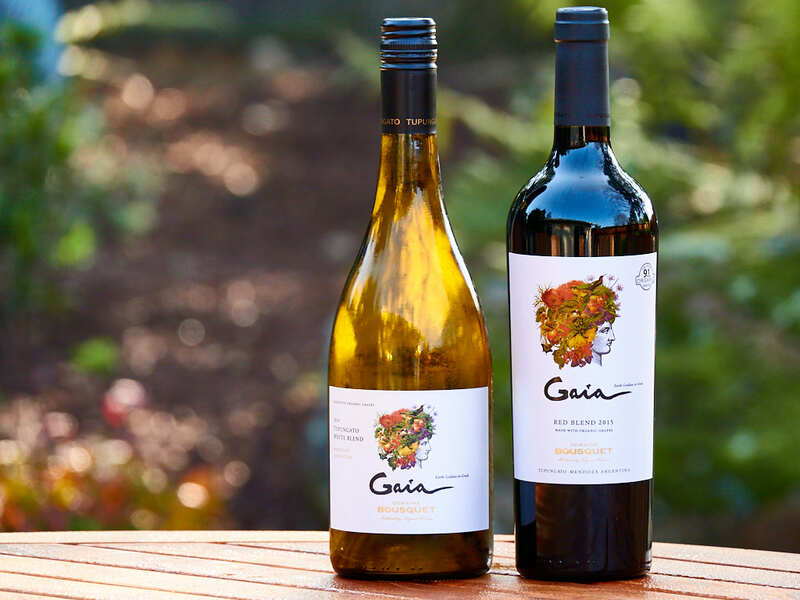 Viticulture and winemaking are certified organic by ARGENCERT in Argentina, which is recognized in the U.S. by USDA NOP (National Organic Program) and in the European Union by ECOSERT, among others. This is one of the things that first drew me to the wines of Domaine Bousquet. By 2005 Jean released his first Domaine Bousquet wines. Jean had winemaking firmly in-hand and with their understanding of world markets and finance both Labid and Anne were able to step in and assist in positioning Domaine Bousquet for success in Europe and beyond. In 2009 Anne and Labid moved to Tupungato full-time. Anne noted pragmatically, “We had an infant daughter so we knew we wouldn’t have much of a social life anyway,” referring to the extremely rural nature of life in Tupungato. They worked alongside Jean in the winery, gaining an intimate knowledge of its workings and overseeing construction at the winery. By 2011 Jean was ready to step back from the day-to-day responsibilities of the winery. At that time, Labid and Anne purchased the winery and vineyards. Jean kept a vineyard parcel for himself, which he still tends today when he’s not keeping an eye on the winery’s Gaia Restaurant. 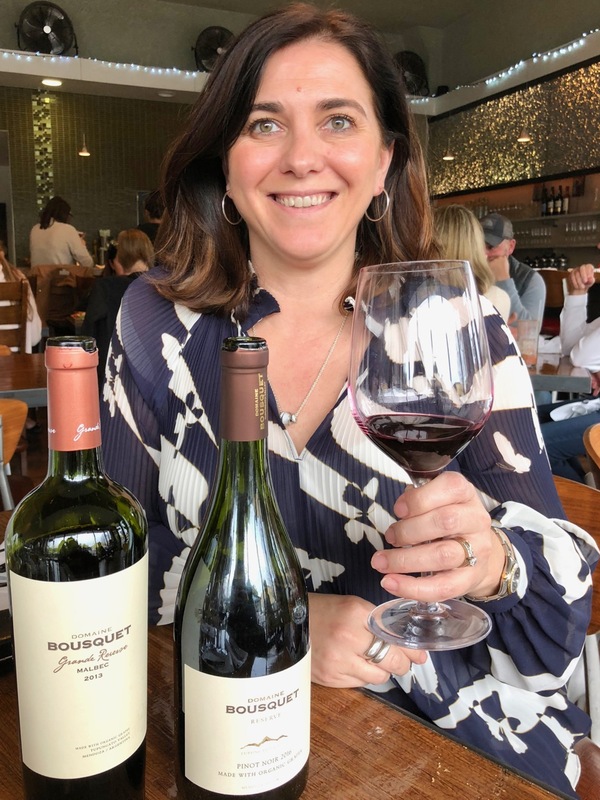 In 2015 Anne and Labid moved to Miami, in part to manage the development of an import company for Domaine Bousquet wines. From Miami business communications with Tupungato are convenient (only an hour or two different – depending on the time of year) and the educational opportunities for their daughter are greater. I’m guessing the social life figures in as well. Anne and Labid alternate spending one week per month in Tupungato. They are both involved in the day-to-day operations of the winery and management of the import business. Production includes a value range, sparkling wines, reserve, grande reserve and Gaia wines. We began our tasting with bubbly. 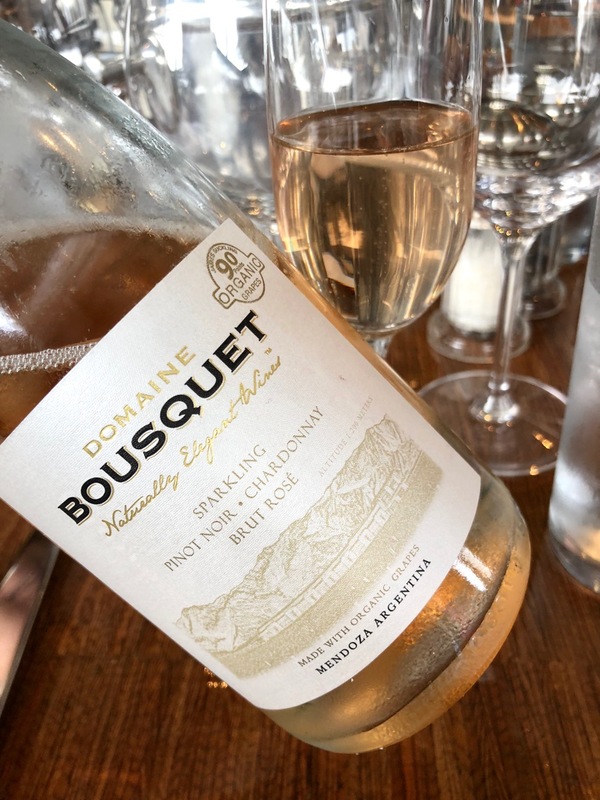 Domaine Bousquet NV Sparkling Rosé Brut is bright and light with generous bubbles and ample berry flavors. The pale salmon color is a result of the blending of 75% Pinot Noir 25% Chardonnay. The second fermentation takes place in pressurized tanks to preserve the bright fruit flavors of the base wines. Pair this wine with just about anything from appetizers to lunch. At $12 to $14 retail this sparkler is a great value. In addition to a white brut sparkler made using the tank method Domaine Bousquet also produces a brut rosé and brut white sparkling wine using the traditional method. 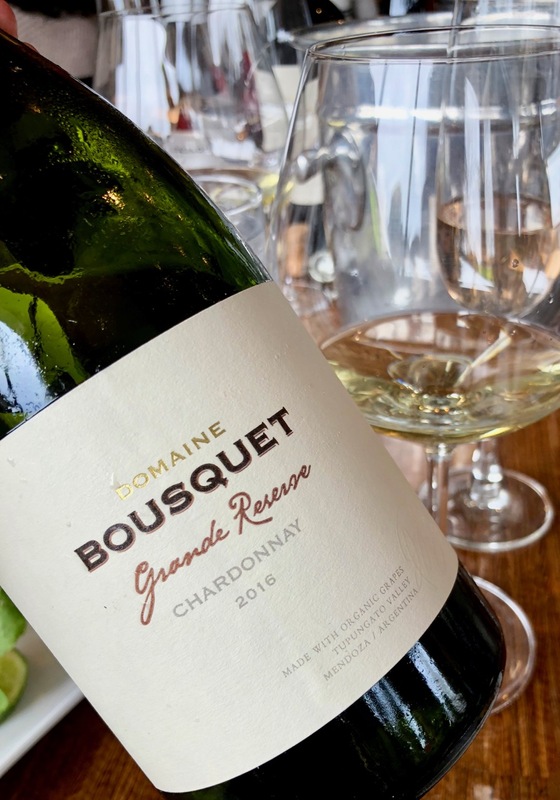 2016 Domaine Bousquet Grande Reserve Chardonnay is light gold in the glass with stone fruit aromas and flavors, dusty minerality and juicy acidity. A hint of cedar spice and a bit of roundness in the mouth that hint at the mostly neutral French oak aging and lees stirring. This is a lovely food wine. Balance is the ultimate goal with every wine produced by Domaine Bousquet. As Anne put it, “We try not to put too much makeup on our wines.” The team at Domaine Bousquet work very hard in the vineyard growing grapes organically and they want that beautiful fruit to be fully expressed in every wine. We talked about the climate in Tupungato. In general it is predictably dry, warm enough to ripen fruit (but not hot) and the nights are very cool. This extends the growing season and allows winemakers to make the style of wine they want. Pick early for a leaner style, later for riper fruit flavors. That said, 2016 was an anomaly. The area received five times the normal amount of rain, compressing the harvest significantly. It was a challenging, but ultimately delicious, vintage according to Anne. 2017 was back to normal and so far 2018 looks the same, though the harvest normally continues until May. 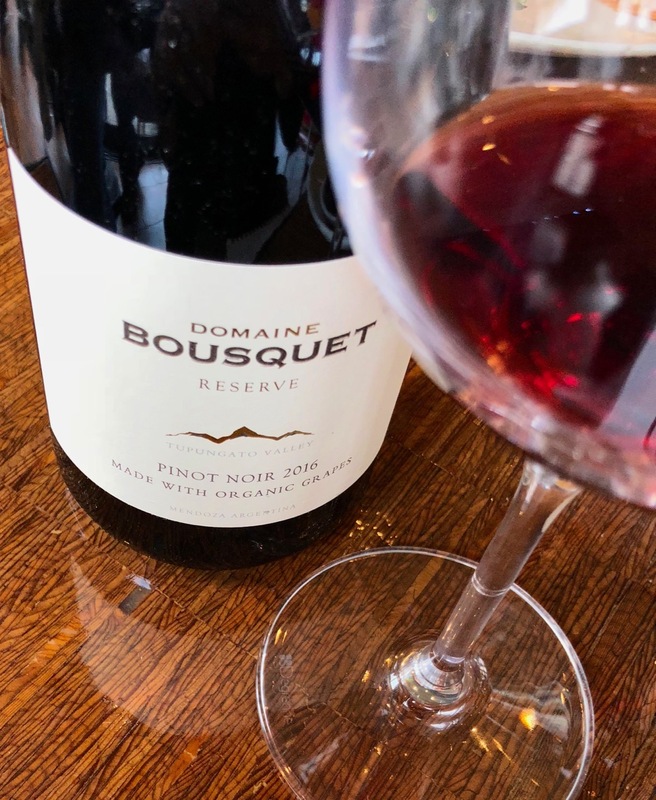 2016 Domaine Bousquet Reserve Pinot Noir is a lovely translucent ruby color in the glass with generous red fruit aromas and flavors. It’s earthy with berry bramble and lots of texture. Give this wine some time in the glass and it will show off. This lovely wine is 100% Pinot Noir, a “single child” as Anne puts it. The Bousquets want you to see the delicate color of this Pinot and to taste its beautiful flavor on its own. Anne noted that the cool nights in Tupungato make lovely Pinot Noir. So true and the retail is only about $16. 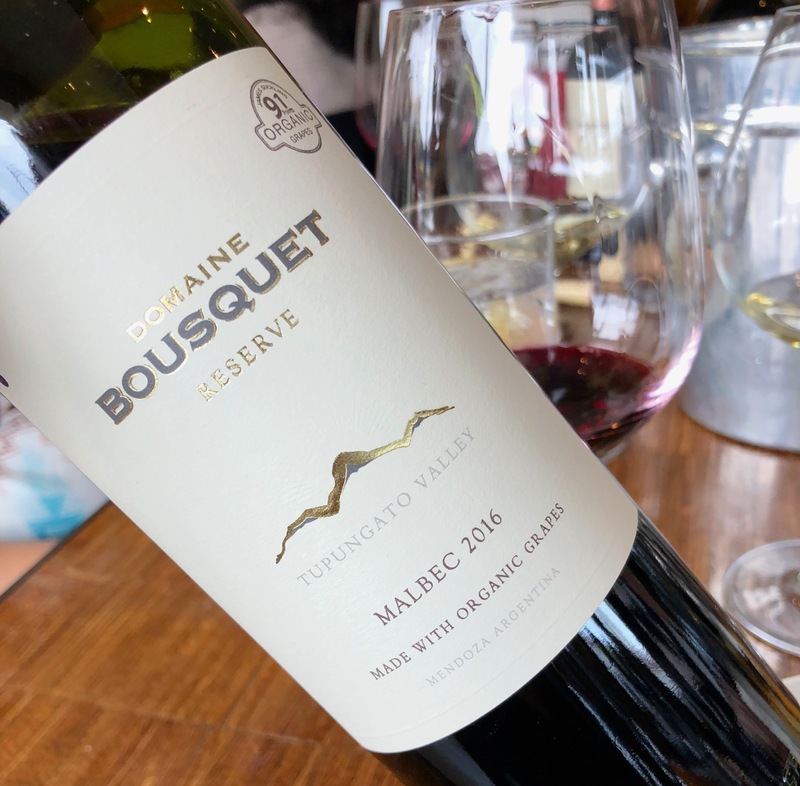 2016 Domaine Bousquet Reserve Malbec is inky ruby in the glass and shows generous aromas and flavors of ripe blueberies and dusty earth supported by grippy, drying tannins. Lovely wine with depth and character, but not too ripe. 85% Malbec, 5% each of Cabernet Sauvignon, Merlot and Syrah. 60% of current wine production is the entry-level wines (non-Reserve and Grande Reserve wines). These wines are sourced from a combination of Domaine Bousquet vineyards and grower vineyards. A benefit of this arrangement to the region, as I see it, is an increase in organic viticulture. Anne explained the benefit to Domaine Bousquet is the availability of organic grapes with complex flavors. Vineyard sites are chosen with this in mind. Reserve and Grande Reserve wines are sourced from estate vineyards and include the best sites and blocks of their vineyards. Oak aging is a few months longer with the Grande Reserve wines. Anne noted they are looking to increase production of the Reserve and Grande Reserve lines which will involve more estate vineyards. They’re working on that. Current production is 4 million liters (about 450,000 cases). 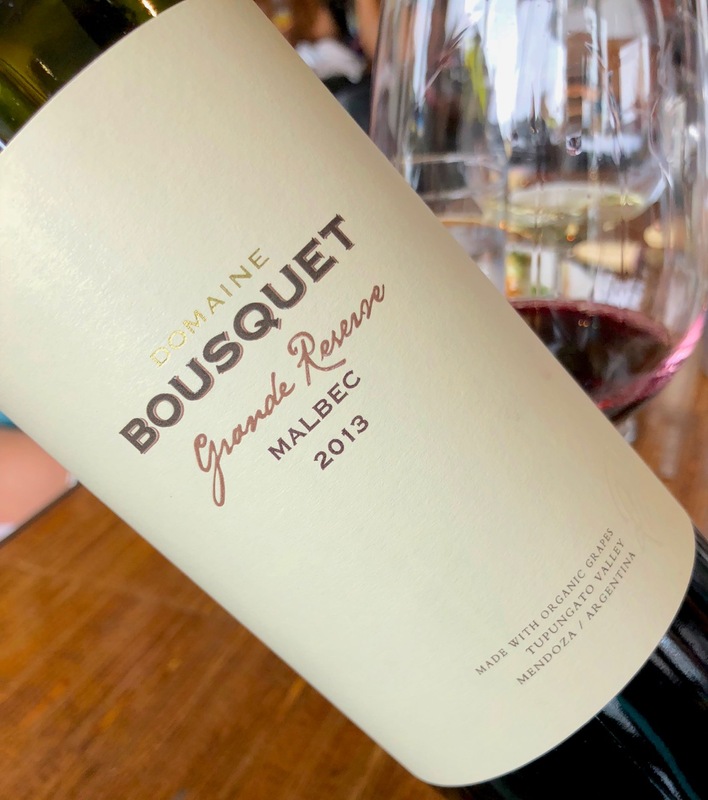 2013 Domaine Bousquet Grande Reserve Malbec is still dense ruby-violet in the glass with complex aromas and flavors of savory herbs, blueberries and minerals supported by drying tannins. The blend is the same as the Reserve Malbec sourced from different blocks or estate vineyards and aged a couple of months longer on French oak. The blend may vary by vintage. At $25 retail this is a very good value and has many years ahead of it. 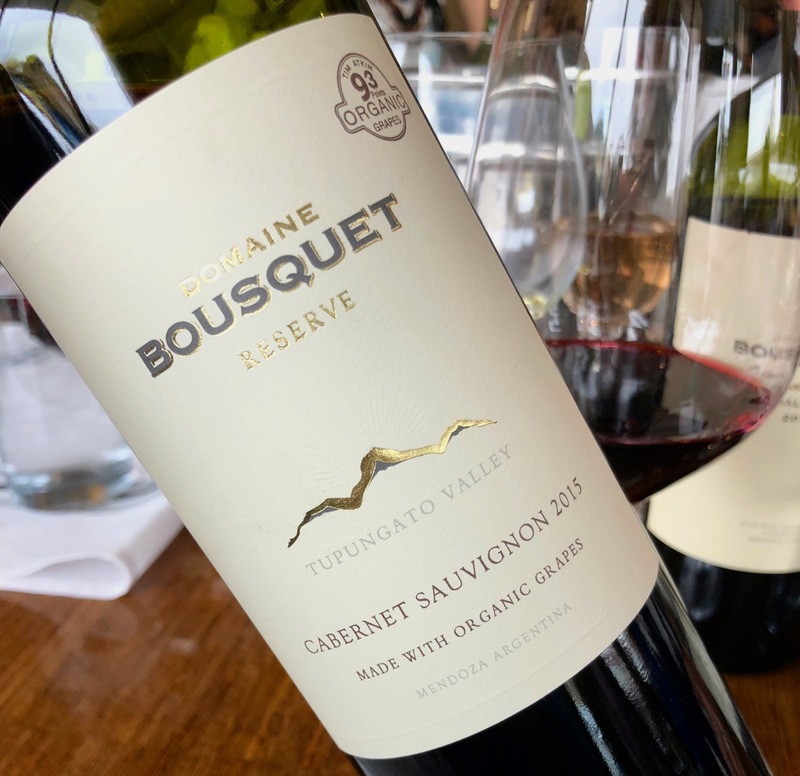 2015 Domaine Bousquet Reserve Cabernet Sauvignon is medium ruby in the glass with red and dark fruit flavors with background flavors of alfalfa and dried herbs. Tannins are well integrated with the flavors. An elegant expression of Cabernet Sauvignon. If you enjoy wines with complexity and character that are made in a restrained style then Domaine Bousquet has a wine for you. Not only is the style elegant but the price in very affordable. It is hard to believe that such interesting and complex organic wines can be made at such a reasonable price. But it’s true. Many thanks to Anne and Kate for the enjoyable afternoon and delicious wines. I loved the bit about “not putting too much makeup on our wines.” Can’t believe how affordable they are, given the care and attention they receive – what bargains! Thanks for sharing your notes, Nancy. Time for me to go get a few bottles.